InventHelp's INPEX is being held June 13-15, 2017 at the David L. Lawrence Convention Center and is open to the general public on Thursday, June 15. 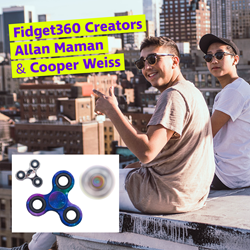 InventHelp’s INPEX, America’s largest trade show for inventors, announces Allan Maman and Cooper Weiss, inventors of the Fidget360, will appear at INPEX Thursday, June 15th from Noon-2:00 pm, at the David L. Lawrence Convention Center to conduct a meet and greet with fans of the popular toy. In addition to meeting the inventors, the first 200 people at the show on Thursday will receive an exclusive INPEX Fidget360 spinner. The idea of Fidget360 sprouted from Allan and Cooper trying to cope with their attention deficit/hyperactivity disorder. After ordering some similar concepts online, they found that the products were overpriced, unreliable and didn’t work very well. The two decided to take action and start their own company to help others in similar situations. The two 17-year-olds, recently featured on Forbes.com, started the company using their school’s 3-D printers, but once the company took off, they moved the business into Cooper’s basement. The next move took them to a warehouse in Brooklyn when the demand became too large. Fidget360 is now shipped to all 50 states, 30 different countries and the duo have 200,000 followers on Instagram. Meet them both at INPEX on Thursday, June 15th from Noon-2:00 pm at the David L. Lawrence Convention Center and take home an exclusive INPEX Fidget360 spinner. InventHelp's INPEX is a trade show that provides opportunities for inventors to present, demonstrate and promote their idea to companies that are looking for new products. The show also features VIBE, or Virtual Invention Browsing Experience. This section showcases more than 1,600 inventions, available for licensing or manufacturing that companies can view on large, state-of-the-art virtual viewing stations. INPEX also offers the George Foreman Inventors University, a series of seminars, presentations and panel discussions to provide inventors and entrepreneurs with information and learning opportunities. INPEX is a service of InventHelp®, a leading inventor service company. For more information about this inventor or INPEX, call 888-54-INPEX or visit http://www.inpex.com.